So, as a brand new (finally!) husky owner, my boy is only a mere 2 months old, Siberian/Malamute I figured I would post a thread and get some tips on what’s best for our little pup. Today is only the fourth day we’ve had him, we have three children and my wife has a 9 year old deer head chiuhuhua. If anyone has any tips about obedience training, length of walks (in summer), grooming, hair cutting?, dental tricks (keep them teeth pearly white), anything is super appreciated. Thanks so much. Finally, at nearly 30 years old I have my DREAM dog thanks to my beautiful wife. Enzo is the sweetest pup I’ve ever had (and I’ve had dogs upon dogs my entire life). Enzo’s Dad was one of the puppy’s from the movie eight below starring Paul Walker (RIP) and his mom is a beautiful pure bred Alaskan Malamute. 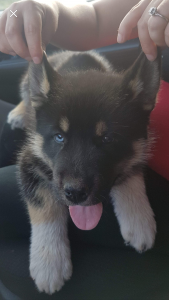 Enzo is a tri color, blue and brown eyed Siberian/Malamute. Lots of training ahead; cannot wait for the adventure with him and my family. 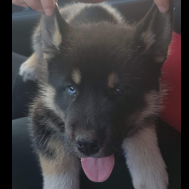 Baby Enzo, two months old, tri color Siberian/malamute our family just got him on Friday sweetest boy ever.